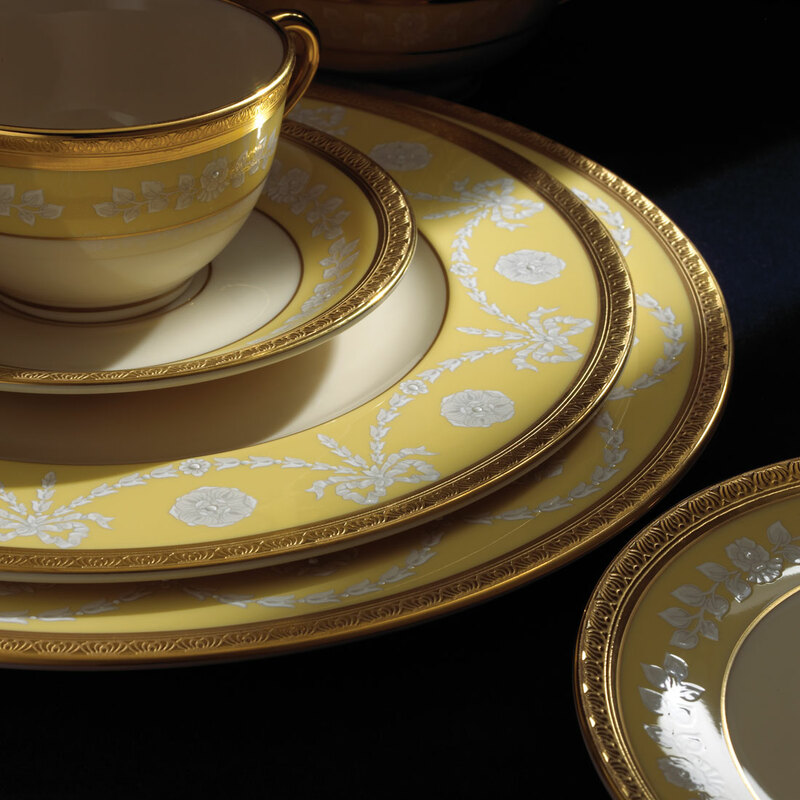 In observance of Presidents’ Day, we take a look at some regal sets of china — designed by Lenox — that have graced the most important house in the nation. At the New York Tabletop Show, held every spring and fall, Design NJ editors revel in what’s new, next and trending in tabletop design. Last season’s visit was no exception. However, a tour of the Lenox showroom also took us back in time with a stunning glass-enclosed display of the state services the company had the honor of creating for six U.S. presidents: Wilson, Roosevelt, Truman, Reagan, Clinton and George W. Bush. We reached out to Timothy Carder, Lenox’s vice president of design (and who personally designed two of the presidential collections) for insight into the tastes and the times that influenced each collection. Design New Jersey: Lenox — founded in Trenton over a century ago — is known as the first American company to design tableware for the White House following Woodrow Wilson’s election in 1913. 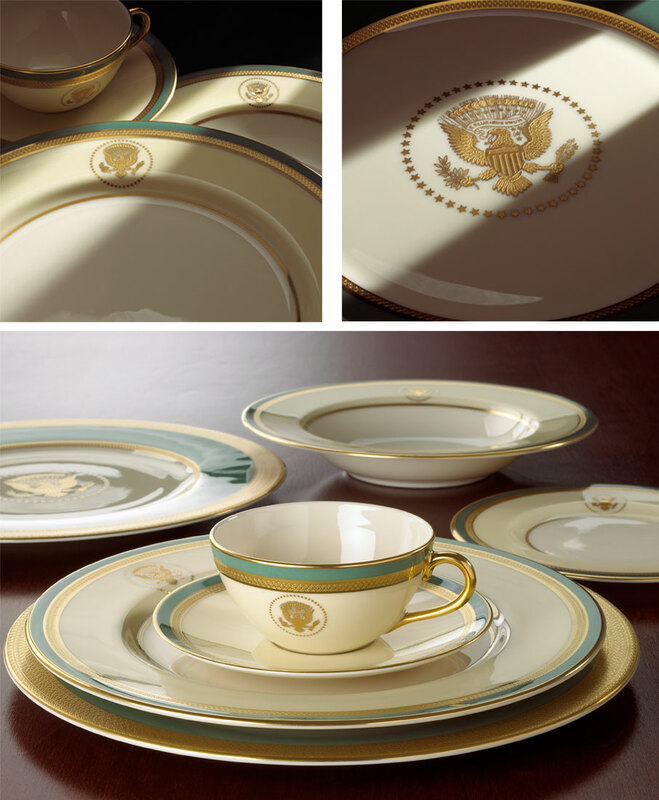 Before that, all presidential tableware was produced in Europe. How did Lenox win over the White House? 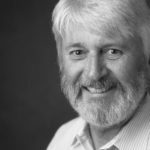 Timothy Carder: By 1917 Lenox had the capability to produce very fine dinnerware and began marketing it in the United States. During the spring of 1917, the important Washington, DC, retailer Dulin Martin Co. was hosting Lenox’s display and, as part of the promotion, sent an invitation to first lady Edith Bolling Wilson. She was very impressed with the display and quality and within a few weeks commissioned Dulin Martin to submit designs for official White House china made by Lenox. The designs were true to Lenox style at the time, making full use of acid-etch gold work and full-rim cobalt borders. 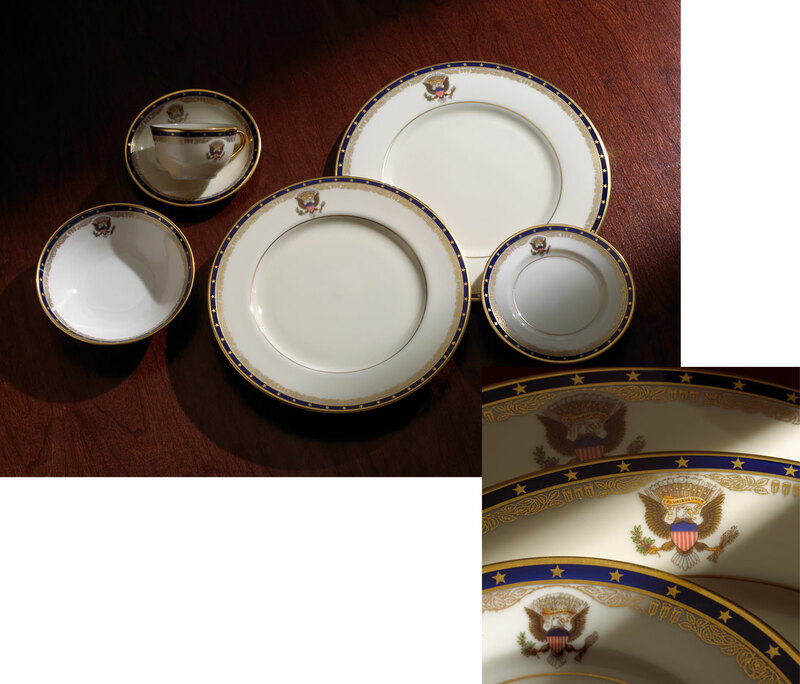 The Wilson service, introduced in 1918 and made in Trenton, was the first presidential dinnerware manufactured in America. 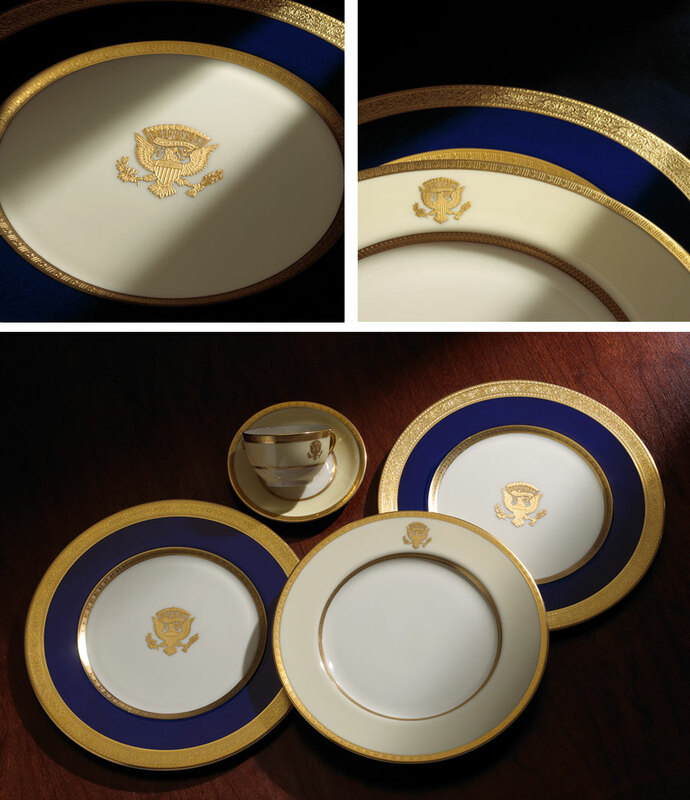 Each of the 1,700 pieces in ivory porcelain with a deep blue-and-gold border has the presidential seal in raised 24-karat gold. 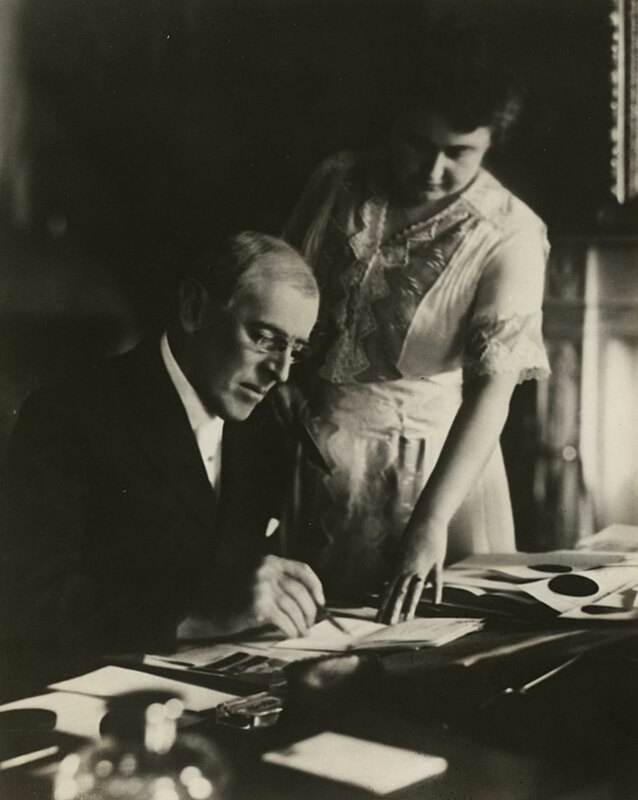 First lady Edith Wilson chose the design “to suit the dignity of the home of the Chief Executive,” according to history by the National First Ladies’ Library. This service remained in the White House until the Hoover administration (1929-1933). DNJ: Is there a common thread with the presidential seal or does it vary in size, style or complexity depending on the pattern? TD: The presidential seal stays the same except for one change. During wartime the eagle faces the arrows and during peace, the olive branch. First lady Eleanor Roosevelt commissioned this service during the Great Depression at a cost of $9,301.20. She assured Americans it was less expensive than replacing the White House’s largely depleted existing china. Made by Lenox in Trenton, it would also put Americans to work. The patriotic service bears a border of 48 gold stars — one for every state at that time — against a band of marine blue, personal to the Roosevelts because of the president’s interest in nautical subjects. Complemented by an inner band of golden roses and feathers, it is also reminiscent of the Roosevelt family crest. (The eagle faces the arrows — not the olive branch — on both the Wilson and FDR china). 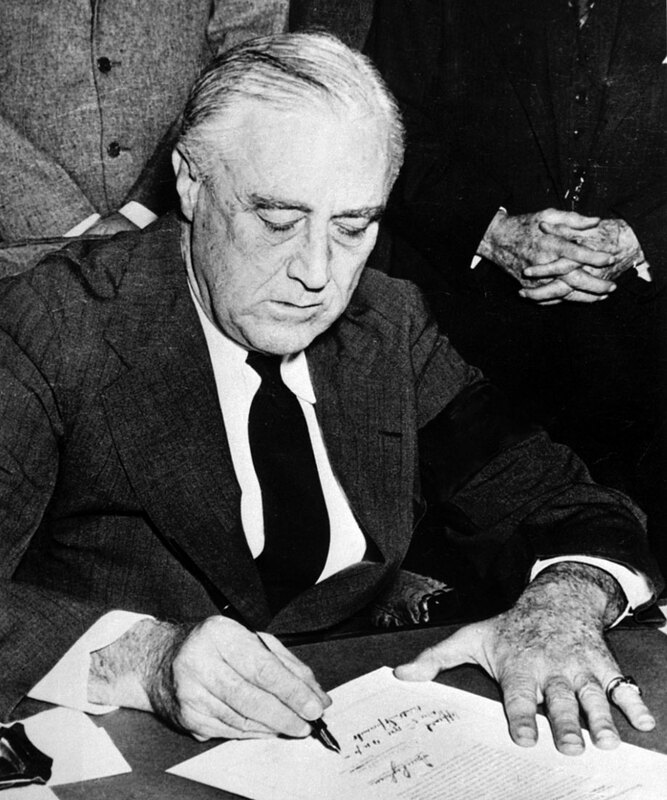 Franklin D. Roosevelt (32nd U.S. President, 1933-1945) signing the declaration of war against Japan, 1941. Following the extensive remodel of the State Dining Room, first lady Bess Truman selected a service to coordinate with the new Williamsburg Green muted wall color. 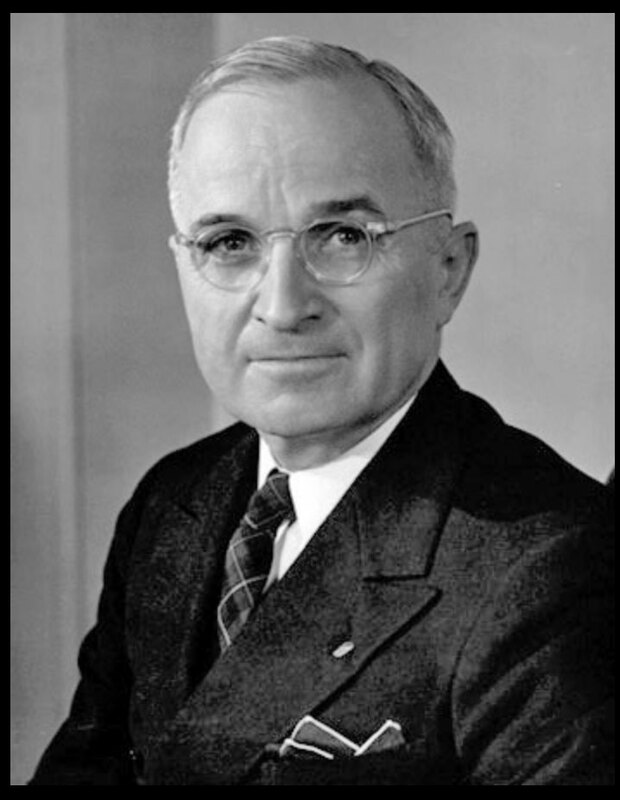 President Truman added his own touch by standardizing the presidential seal in 1945. The eagle’s head now always faces the olive branch of peace, and it always grasps the “E Pluribus Unum” banner in its beak. DNJ: Nancy Reagan was famous for her love of red, which I imagined influenced the beautiful scarlet-rimmed dinner pattern from that administration. Has that shade of red been used in any other Lenox collections? TD: The shade of red used for the Reagan service was specified by Nancy Reagan and a hard color to achieve; it will probably never be used again. 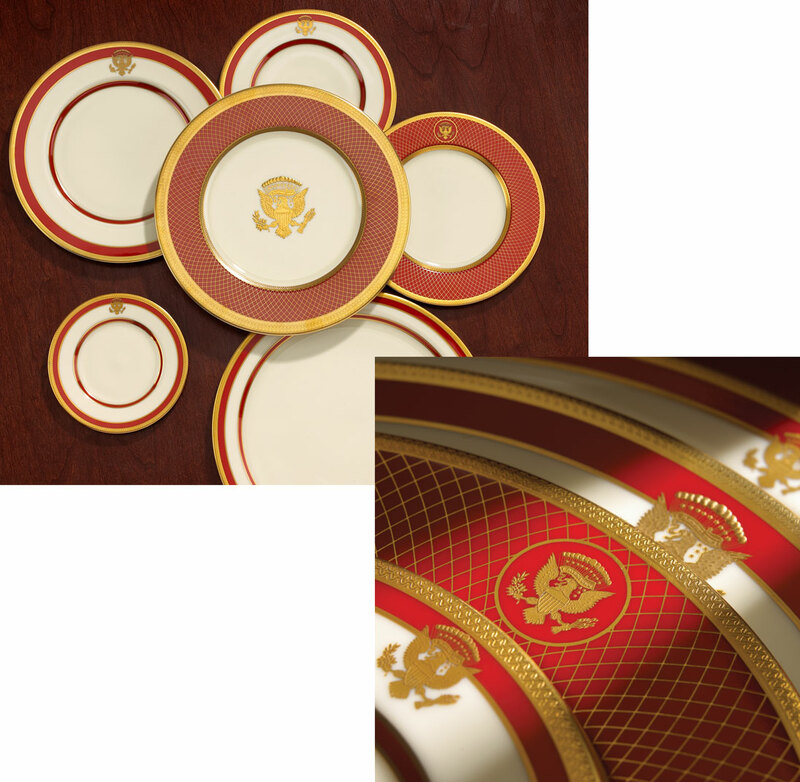 The Reagan service was modeled on Woodrow Wilson’s china and features the presidential seal in burnished gold on an ivory background with a border of scarlet — not only Nancy Reagan’s favorite color but also one that made a strong statement against the State Dining Room’s newly painted white walls. 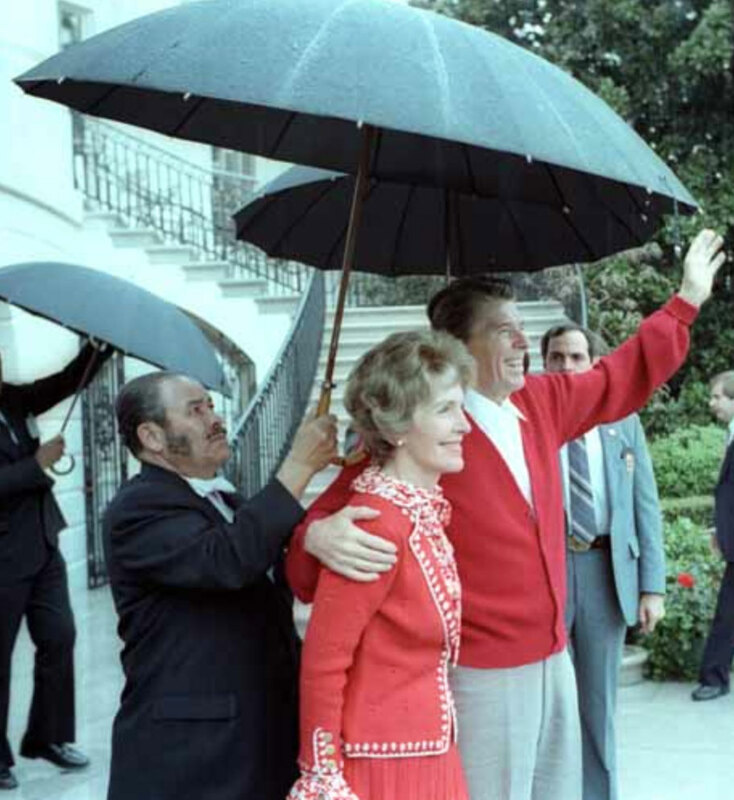 Nancy and Ronald Reagan (40th U.S. President, 1981-1989) outside the White House in 1981. DNJ: Has the number of presidential/state service requirements increased much from the early years to present day? Also has the size of the dinner plate changed along with the American appetite. TD: The size of the dinner plates has always been the same, and the State Dining Room has a maximum capacity of 300. The Clintons chose to go with the full 300 place settings while Reagans used 250. 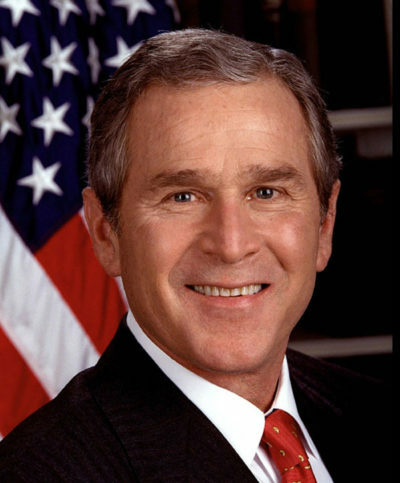 DNJ: You specifically designed the dinnerware collection for Bill Clinton’s administration as well as George W. Bush. 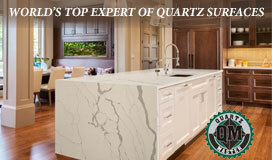 Describe that experience and the inspiration behind both designs. TD: Working with Hillary Clinton and Laura Bush were true collaborations. 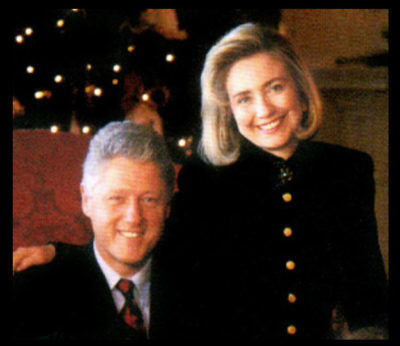 The Clinton service was inspired by ornamental plasterwork in various state rooms. Each piece in the place setting was different, and the service plates had etched and embossed designs covered with several layers of 24-karat gold. The Bush service was inspired by plates that Dolley Madison had acquired, and the eagle used was taken from a piece of antique furniture. Neither service used the presidential seal. 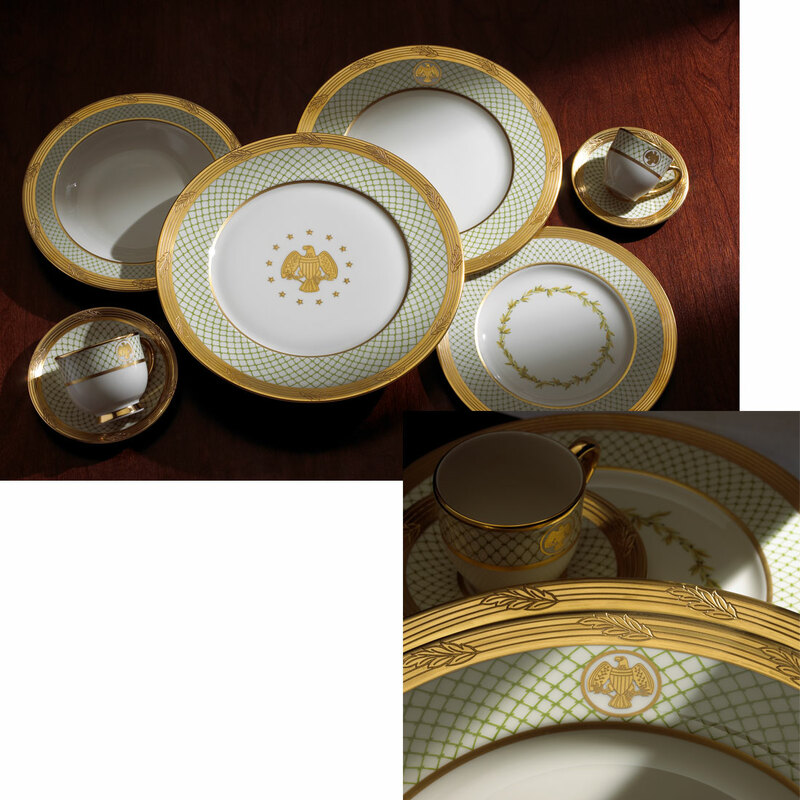 The Clinton china features a border of pale creamy yellow, instead of the bright primary colors on previous services, and images of White House facades in place of the presidential seal. In commemoration of the 200th anniversary of the White House in 2000, each piece is decorated with a different pattern, the motifs derived from architectural elements in the State Dining Room, East Room and Diplomatic Reception Room. First lady Laura Bush chose a soft green pattern due to its versatility and ability to coordinate with a variety of colors. The trellis border was inspired by a French dinner service owned by President James and Dolley Madison. DNJ: Does every administration introduce its own china? Not every administration chooses to create dinnerware. If they do it’s usually in the second term. 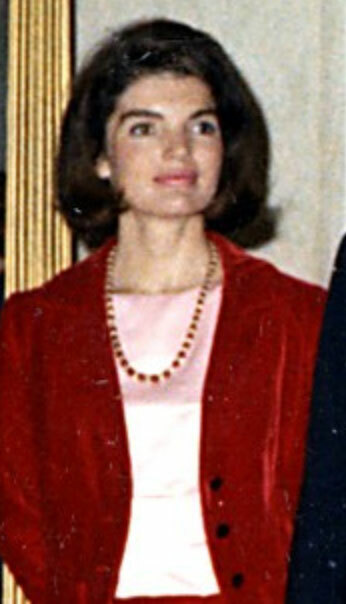 First Lady Jacqueline Kennedy ordered no china for the White House and usually used the Truman china with the Eisenhower service plates for state dinners, according to research from the John F. Kennedy Presidential Library and Museum. The Bush administration also made use of various presidential services, including the Reagan and Clinton china, when entertaining. 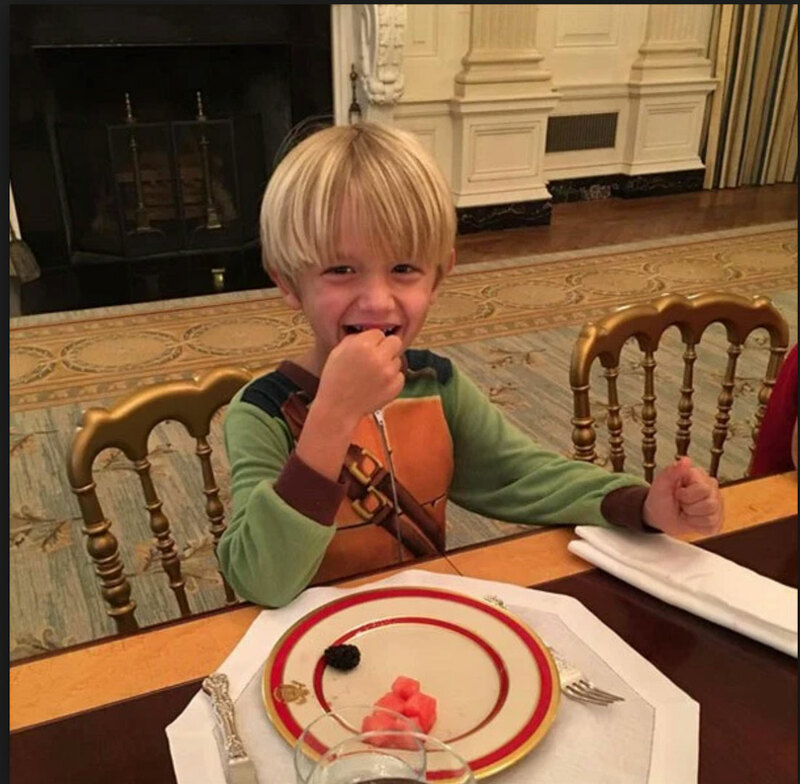 While it’s unclear whether the current administration will introduce its own china, the Washington Post reported that President Trump and family are breaking out the Reagan place settings as seen in this Instagram post showing Donald Trump Jr.’s son Tristan enjoying lunch off a plate of scarlet and gold bearing the presidential seal. Editor’s Note: Lenox ceased manufacturing in Trenton in the mid-1970s and moved to Pomona, where it made ivory china. In 2005, the Pomona plant began to wind down as manufacturing moved to Kinston, North Carolina. Company headquarters are in Bristol, Pennsylvania.